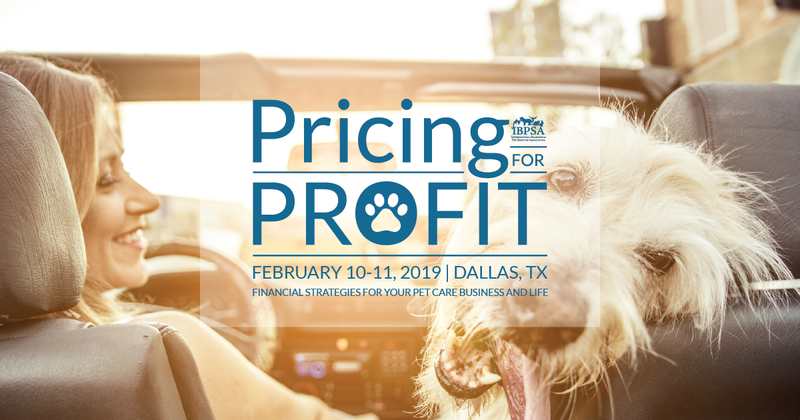 Our next Pricing For Profit, a financial workshop that brings real financial strategies for your pet care business and life, will be held February 10-11, 2019, at the Hyatt Regency DFW in Dallas, Texas. Here, you can register Pricing For Profit. Just follow the green "Register Now" button. Are you running your pet care business or is your pet care business running you? All too often it can feel like the latter. Pricing For Profit is a financial workshop dedicated to helping you make sure you’re working smarter, not harder. • How can I leave my business for a vacation and know it will function fine without me? • How can I get more personal time and less aggravation running my business? • How can I be sure I fully understand the financial side of my business and how can I make it better? • How much is my business really worth and how can I build its value in the near future? • How can I raise my rates painlessly, not lose business, and find out what I really need to charge to make the profit I want? • How can I make more profit with the overhead I currently have? • How can I achieve a real exit strategy and a solid financial future? Why not take a step back and take a fresh look at your financials with a business profit coach? The Pricing For Profit workshop is a 2-day course happening February 10-11, 2019, in Dallas, Texas. The price is just $575 for IBPSA Members and $675 for Non-members. A small investment compared to the potential for huge gain. Whether you’re new to the business or need to take a moment to ensure you’re still making the most of your business, don’t miss this real-world financial education opportunity. For more details on this unique financial workshop designed for pet care business owners and managers, visit ibpsa.com/p4p.